Peptide (C)RARFSQMRKDVLEK, corresponding to amino acid residues 305-318 of rat PICK1 (Accession Q9EP80). Intracellular, α-helix domain. 1,2. Anti-PICK1 Antibody (#APZ-014), (1:200). 3,4. Anti-PICK1 Antibody, preincubated with the control peptide antigen. Immunohistochemical staining of perfusion-fixed frozen mouse brain sections using Anti-PICK1 Antibody (#APZ-014), (1:400), followed by anti-rabbit-Cy3 antibody. 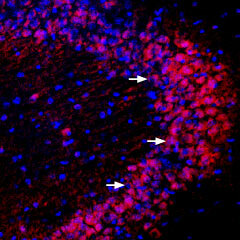 PICK1 staining (red in the hippocampal CA3 region) is detected in neurons (arrows). Nuclei are stained with DAPI (blue). Bolia, A. et al. (2012) Proteins 80, 1393. Staudinger, J. et al. (1995) J. Cell Biol. 128, 263. Zhao, B. et al. (2012) Cell Res. 22, 1467. Zhang, B. et al. (2010) Cancer Sci. 101, 1536. Jensen, L.J. et al. (2009) Nucleic Acids Res. 37, D412. PICK1 interacts with the PDZ motifs of several proteins, including: protein kinase C α (PKC α), glutamate receptors (GluRs), prolactin-releasing peptide (PrRP), acid-sensing ion channel (ASICs), dopamine transporter (DAT), Karlirin 7, ephrin type-B receptor 2 (EphB2),ErbB2 / Her-2, TIS21, coxsackie virus and adenovirus receptor (CXADR), and UNC5H. The proteins interacting with PICK1 have roles in synaptic plasticity, neuronal cell morphology, and mitochondrial-dependent apoptosis. In most of the cases, PICK1 acts as a critical regulator of membrane receptors' subcellular trafficking to modulate neural processes such as learning and memory1. PICK1 is widely expressed in brain, testis, heart, lung, liver, kidney and muscle2. Its abnormal expression in brain has been linked to drug abuse and dependence, schizophrenia, and psychosis. Recent evidence suggest that PICK1 may affect human cancer development3,4. PICK1 has also been reported to be expressed in insulin-producing pancreatic beta-cells where it may play a role in the neuroendocrine system5. Immuno-colocalization of GluR1 and PICK1 in rat hippocampus.Immunohistochemical staining of immersion-fixed, free floating rat brain frozen sections using rabbit Anti-PICK1 Antibody (#APZ-014), (1:400) and Guinea pig Anti-GluR1 (GluA1) (extracellular) Antibody (#AGP-009), (1:400). A. GluR1 staining (green). B. PICK1 staining (red) in the same section. 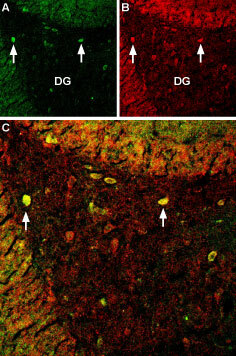 C. Merge of the two images reveals co-localization in several interneurons (arrows) in the dentate gyrus (DG). Alomone Labs is pleased to offer a highly specific antibody directed against an epitope of rat PICK1. Anti-PICK1 Antibody (#APZ-014) can be used in western blot and immunohistochemistry applications. It has been designed to recognize Protein interacting with C kinase 1 from rat, mouse and human samples.